My second year studying Journalism and Communications at Cardiff University has come to an end. Though I am so relieved and grateful to be back at home, it has come to realisation just how fast time goes! Two years ago, I was still in the midst of all my revision. May and June are the most stressful months for every single student taking exams or submitting coursework. If you are a student and you are not stressed out, I think you are just lying. Though I was very pleased with my progress in 6th form, it wasn’t exactly a walk in the park. 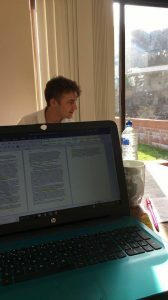 Like many other people, I struggle to find the motivation to actually sit down and do revision. I am too easily distracted – Netflix? Yes please. Clean my room? It needs to be done. Take a nap? Well deserved. And this still occurs today, probably even worse so as I don’t have my parents here to check I am still alive every hour. 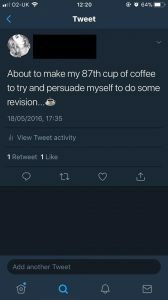 So, I thought it would be interesting to look at what I was doing two years in the month of May, when I was still revising and looking forward ahead to University. Mostly, it’s just proof of my procrastination as a 6th form/college student! And if you thought this was going to be a helpful blog filled with advice on how to not procrastinate, you’ve come to the wrong place. Have you applied for accommodation yet? By the 5th of May in 2016 I had finally made my accommodation choices for Cardiff University, with Talybont North being my first. If Cardiff is your first choice and you haven’t chosen your accommodation yet, go, go, go! The most difficult thing for me choosing accommodation is that you must write down all the accommodations in order of where you’d like to live. After I’d completed the top three, I didn’t really know where to go from there. But don’t worry – take your time! There were some successful days! Hallelujah! As mentioned, it still does take some real self-control to do some revision when all I want to do is jump into bed and binge watch the newest series on Netflix. Normally, I’ll try and give myself an incentive such as, if you do an hour of revision you can watch Netflix! Give it a go. 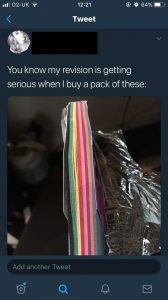 I am still using revision material like this in University! I always get my best revision done when I buy myself something colourful to scribble my mind maps on. I also use revision cards and A3 sheets because it’s something new and different. Keeping your revision interesting makes it’s easier to want to do. Of course, I am still relying on the glorious, miracle drink that is coffee. I am thankful that Cardiff University has coffee cups everywhere because I honestly wouldn’t survive. Even when I am at the library late and the café closes, I stumble over the road for a Costa! Coffee is my fuel. Overall, everyone has days where they just want to lay in bed and watch Netflix or only manage to get one hour of work done. And other days you’ll be on your 87th cup of coffee starting your millionth practise essay. There are good days and bad days – but at the end of them all, you can only do your best. I hope everyone’s exams are going well and you’re looking forward to the summer.